Frank James Lampard was born on 20th June 1978 in Romford. He is from a big footballing family as several members of his family including his father, uncle and several cousins have all been involved in the game. Frank followed in their footsteps from an early age and could always be seen with a football at his feet. He has always been a determined person and his never say die attitude landed him a place in Heath Park’s youth team. This breakthrough led him to get trials for Tottenham, Arsenal and finally West Ham who he signed a youth contract with in 1994. After a year at West Ham he was sent out on loan to Swansea. His determined nature shone through again as Frank saw this as a need to improve as a footballer and so this is what he set out to do. Even though the training facilities at Swansea weren’t as high a standard as those at West Ham frank used them to their fullest and built up his strength. On his return to Upton Park he was ready to fight for a first team place. However, it wasn’t until the 1998/99 season that he finally established himself as a regular first team player, playing every game that season. Both his uncle and father quit their jobs in the 2000/01 season as manager and assistant manager respectively and so Frank Lampard took the decision to make a move also, signing for Chelsea for a reported fee of £11 million. The Chelsea manager at the time, Ranieri, was a huge Frank Lampard fan and so Frank found himself in the thick of first team action as soon as he arrived at Stamford Bridge, making his debut against Newcastle United on 19th August, and going on to appear in every game that season, scoring 8 goals. His game continued to improve and in the 2002/03 season Frank Lampard hit double figures for the first time, scoring 10 goals. Frank was already an England player by this time but it wasn’t until the match against Croatia on 20th August 2003 that he scored his first goal for his country. Frank Lampard started to show what he was really made of though when in the Summer of 2003 one of the richest men in the World bought Chelsea Football Club and Frank suddenly found himself surrounded by World class footballing talent. In the 2004/05 season he netted 19 goals across all competitions and hit 20 the season after that. Picking up trophies along the way, Frank Lampard scored his 100th goal for Chelsea during the 2007/08 season which for a central midfield player is an astounding achievement. Frank Lampard has come along way from playing in his back garden with his uncle and his father, and although now in his thirties, he still plays at the highest level of football and is recognised as one of the best midfielders in the world. At the time of writing this (May 2012), Frank Lampard has appeared for Chelsea a total of 558 times, scoring 186 goals, 126 of which were scored in the Premier League. 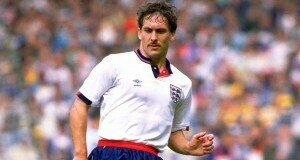 He has been capped 90 times for England, scoring 21 goals.